With a recent PEW study citing that 64% of American adults have a smartphone and 50% of American adults have an internet connected tablet, it is clear that mobile technologies have widespread influence. A number of customer-centric industries including retail, hospitality, and transportation, are beginning to leverage the power of mobile consumer engagement, and one of the biggest industries also feeling the effects of a more mobile society is healthcare. 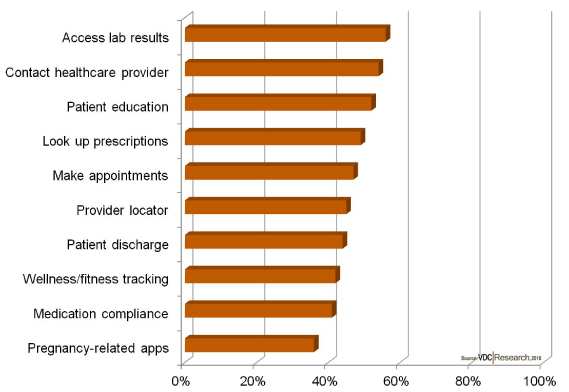 With so many healthcare providers looking to increase patient satisfaction rates and engagement rates, HIMSS vendors had a number of solutions on display which can help re-engage with patients expecting a more mobile experience. The maturation of the mobile device market, vis-à-vis the increased consumerization of tablet and smartphones, has allowed application developers to re-engage patients and healthcare teams on a new level. This refocusing of energies comes at a time where patients are looking for more from their providers than just a once–a-year check-up. Patients are looking to be able to connect with healthcare teams easier, faster, more effectively than ever before: all-in-all they are looking for an upgrade. As demonstrated at last week’s HIMSS conference, both hardware and software vendors, as well as systems integrators came prepared to show how new technologies can assist with this upgrade. This plea from patients has not gone unnoticed by healthcare providers. In fact, a recent 2015 VDC Research healthcare survey revealed that 65% of healthcare service providers list enhancing the patient experience as a leading pressure to invest in mobile healthcare. Furthermore, 59% of respondents also indicated that enhancing patient service quality was also a leading pressure for mobility investment. Based on these mobility investments, healthcare groups are developing and deploying a wide range of interactive applications for their patients. In fact, more than 50% of healthcare services providers indicate that their applications now allow patients to: access lab results, contact their healthcare provider, and look-up important educational information about diseases and medications. While Figure 1 indicates fairly good penetration, with between 36%-56% of applications being supported on mobile platforms, there is far greater opportunity further deployments. The greatest opportunities for this increase come in the form of enhanced communication between patients and healthcare providers. Being able to contact providers, access prescriptions and lab results are applications which can provide important information to patients and attending physicians alike. Furthermore, medication compliance and the ability to make healthcare appointments via mobile devices should witness adoption rates of at least 75% by 2019. Both Panasonic, and Samsung, through their Knox integration, are creating solutions in areas such as medication compliance, surgery recovery/monitoring, and general patient engagement tools. Many additional vendors and ISV’s have shown significant interest in medication compliance because the aging baby boomer population would provide high demand and relatively quick adoption rates. While it is clear that a renewed focus on patient engagement is the future for mobility in healthcare, it is a road paved along many peaks and valleys. Valleys include complex patient data privacy and security measures and continued regulation compliance (HIPAA, PCI, etc.). However, many peaks promise significant avenues for advancement and adaptation of new technologies. Currently, companies like 3P Health and Epic are working to further integrate all aspects of healthcare into one location. From insurance information and payment methods, to electronic medical records (EMRs) and fitness tracker data, the healthcare community is creating a vast amount of generally underused and under accessed data. 3P and Epic are creating a solution where all this healthcare data can not only live, but also be accessed by patients, their healthcare teams, and insurance companies. Although these are just a few examples, the entire healthcare ecosystem continues to evolve and adapt to new technological innovations. While current and future technology assures continued advancement in the healthcare industry, the increased collaboration and communication between patients and their healthcare teams will undoubtedly remain a focal-point for many years to come. Expect to witness an even greater focus on patient interaction and engagement as mobility solutions further transform the implementation of medical care.